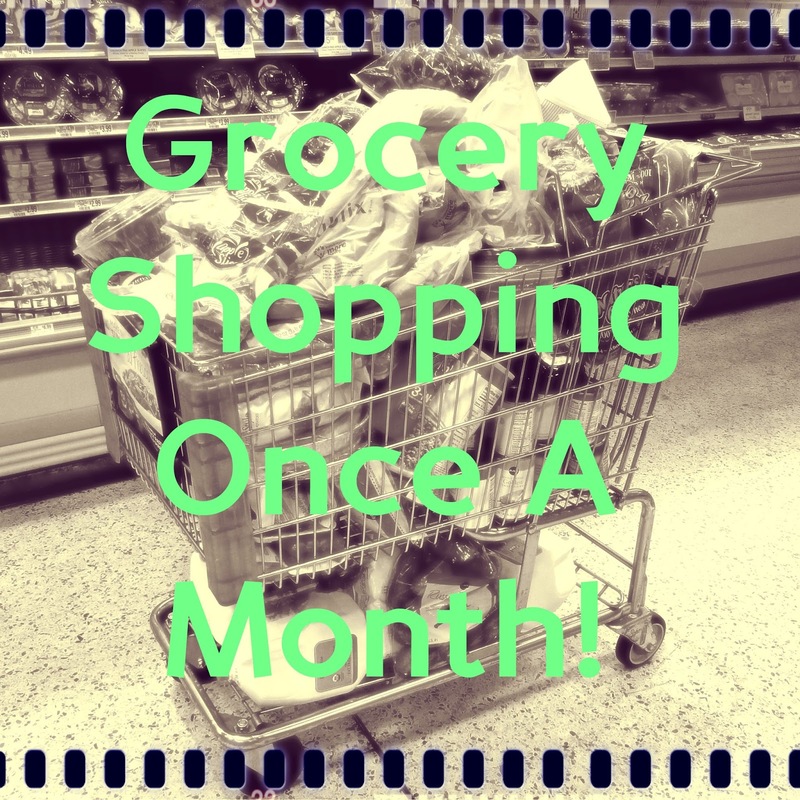 Spending Smart: Groceries Once A Month! I know some of yall have been waiting on this post for awhile! 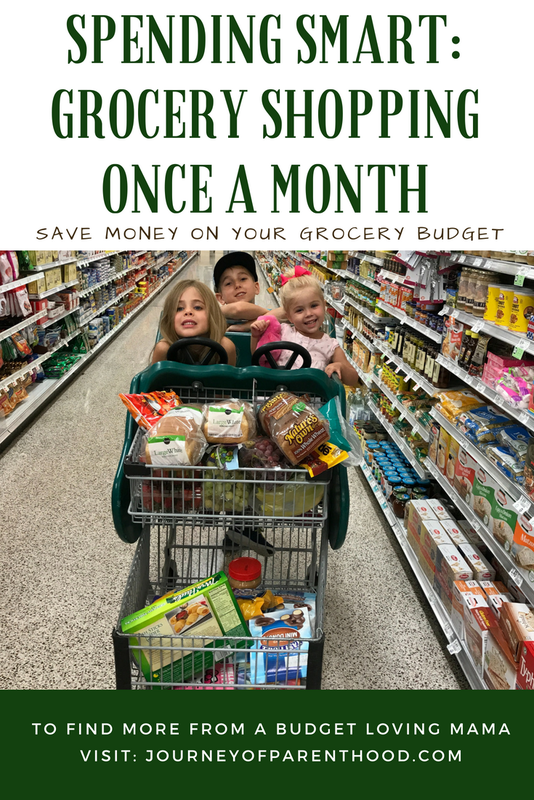 Years ago I read somewhere that it’s best for your budget to only grocery shop once a month. I guess you’re less likely to do impulse buying? For whatever the reason, I decided to try to grocery shop for our family one time a month. For years I’ve been doing this but just recently I got serious about it. In the past I would do one BIG trip a month but then Zach or I would still run out to get more of the fresh stuff like milk, fruit, etc. Now that we are very focused on spending smart, I’ve gotten a solid routine down and truly do only do one grocery shopping trip each month! Being able to do one big grocery trip takes a bit of planning. I like to do my shopping around the first of each month. Since I am such a planner I typically already know of special things we will need…food to take to events, meals we plan to cook for others, times we will be traveling, etc. This allows me to do meal planning and to make sure we have everything we will need for the entire month. When we got serious about our spending I went through ALL of our cabinets, pantries, refrigerators, and freezers. I purchased the Prep and Pantry App and did an inventory of everything we already had. I am a slight horder when it comes to things in that I like to stock up. Robyn made fun of me for having like five boxes of cake mix in my pantry haha. But I keep a good base amount of food on hand at all times. As they run low, I buy more. Having this app allows me to know what things we already have on hand so I don’t buy stuff that we don’t need. Throughout the month I keep a running list in the kitchen of things we run out of or think of that we need to buy at the store. When the month ends I get that list transfer the items in their appropriate spots on the spreadsheet I print off of our local Publix. While I was pregnant with Britt Zach started doing the grocery shopping for me. It was frustrating to have to read the grocery list over and over again on each aisle and miss out on things and have to back track, etc. So Zach came up with the idea to write down each aisle of the store and what items were where. I put the list into a spreadsheet and put spaces below each aisle to write down what I needed. 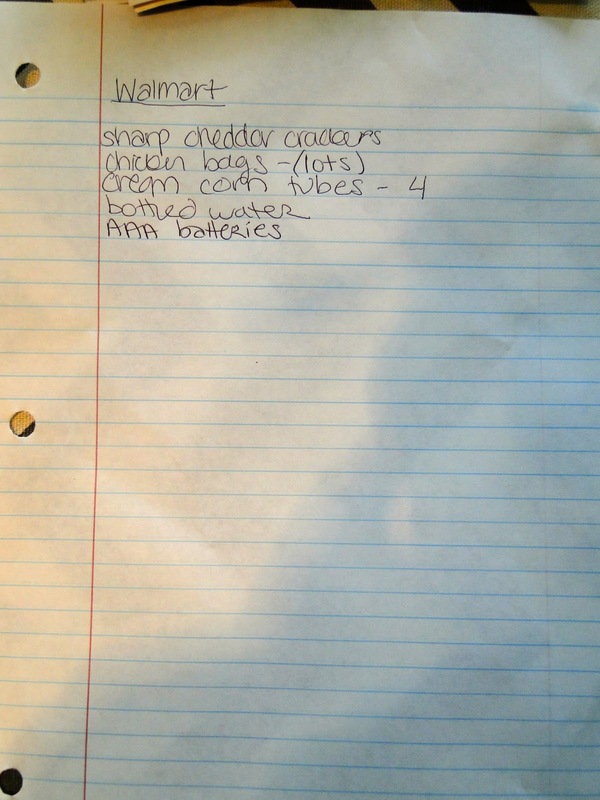 This was I have an organized list and it makes shopping much quicker and more efficient! I also store all of my recipes in a recipe box. Katie bought my box for me when I was engaged but I got the idea actually in high school when I took a Foods class. 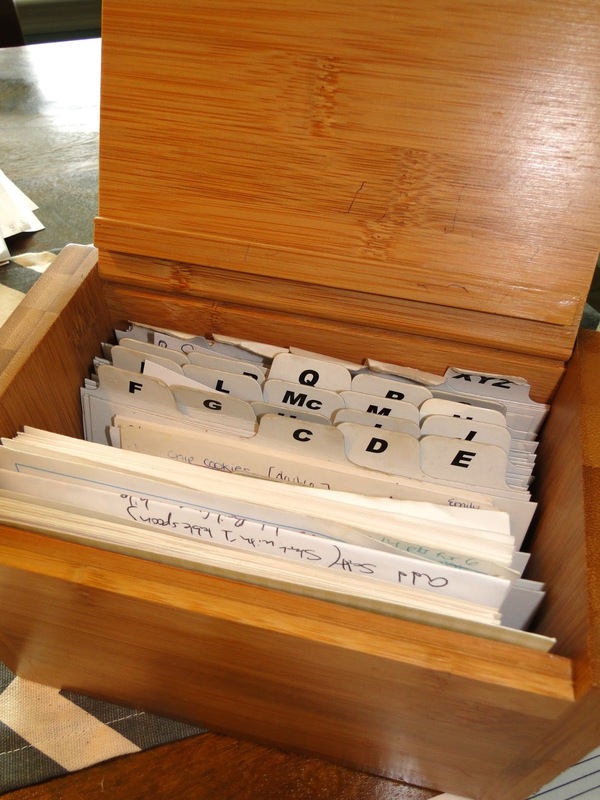 I have it organized alphabetically and write down all my recipes on notecards. On the front of the card I have the ingredients and on the back I have the directions. At the beginning of each month I go through my recipes and pick out all the things I want to make that month. I know I’ve seen many blogs that plan the meals for specific nights, but I don’t do that. If I know we’re having company in the coming month I may go ahead and pick out specific things for that, but for just our family I don’t “meal plan” to the extent of knowing what we will eat each night. My pre-grocery shopping prep spread! Zach, however, doesn’t mind Walmart runs so I do the BIG grocery shopping trip at Publix but make a separate Walmart list for him to do a run. The things we get at Walmart are only stuff we know is cheaper there. Usually our personal hygiene items, household stuff (like batteries and light bulbs) and a few food items (like the bags of frozen chicken breasts). As I decide all my meals for the month I will make a notecard with all of them listed on it. That way each day I can glance at the “Meal Notecard” and decide what to cook. We eat MAJORITY of our meals at home. I typically cook 4-5 nights a week and we will have 1-2 nights of left overs and typically Zach will cook one night (usually on the grill). With our busy travel lives and Zach’s often crazy work schedule, it doesn’t always work out that way but if everything is “the norm” then that’s our typical week. I list all the crock pot meals in one column and the other meals in another. I also make some food that is good frozen so I will buy double the ingredients for what we need for dinner then freeze the extra. It’s great for nights we have church or other things and need something quick! I put a * next to any of the meals that require using ingredients that will expire. Typically it’s recipes that require sour cream as it goes bad quickly and I haven’t had the guts to try freezing it yet? When I see the * it reminds me to cook that meal towards the beginning of the month! I go through the prep and pantry app to see what ingredients I need to add to my grocery list and write in all the things I always need at the start of the month…breakfast and lunch basics like bread, fruit, etc. I put the “Meal Notecard” on top of all the recipe cards for that month (as well as any printed pages I printed off from Pinterest to try!). I keep the stack in a cabinet in our kitchen so I can easily grab it. Once I cook a meal on the list I mark through it on the “Meal Notecard” then return the recipe card back to where it goes in the box. If the recipe is from a printed page and we liked it then I will make a recipe notecard for it and it will go in the box. Pretty simple system! 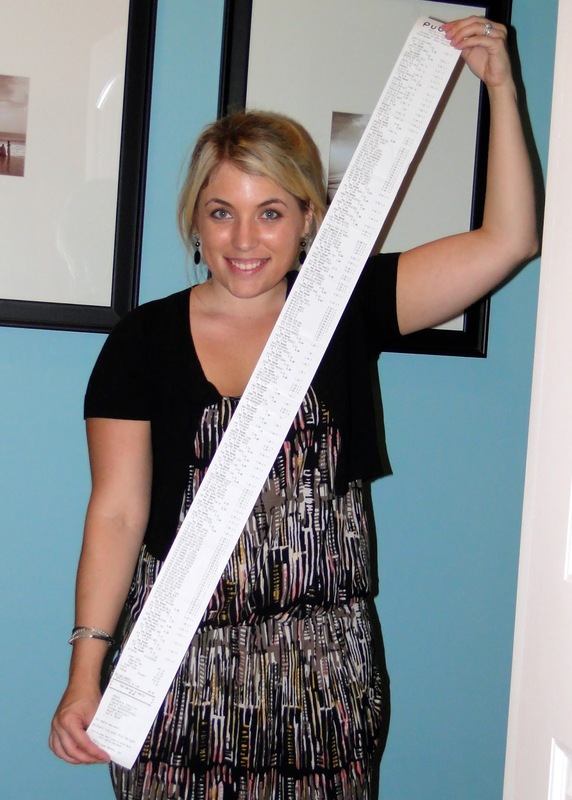 I have never attempted my monthly grocery trip with any children. Not that I don’t think my kids would behave…I just like to get it done quick and I also don’t know how they would possibly fit in the cart! I plan to go on a night when Zach is home at a decent hour from work and can feed the kids dinner while I’m gone. Often I will pick up something for myself for dinner prior to shopping so I’m not hungry or Zach will plan to cook something for me that night after the kids are in bed. Either way I get kind of a “treat” in return for my efforts haha! As I go through the store I mark off the things on the list as I buy them and will write in anything I need to add to the Walmart list. Sometimes they are out of things I need or I think of things while shopping to have Zach get later on. It used to take me two hours to do my shopping, but now I’ve got it down to under 90 min. I actually enjoy this time! I like to sing along to the music playing (often it’s some good John Mayer haha) and I enjoy the quiet time to myself. As I shop I am always mindful of prices. I do not do coupons. I actually went to a coupon class a couple years ago and when the lady said she spends FOUR HOURS each week organizing and clipping coupons I decided it wasn’t for me. My time is more important than saving a little money. And I have found that typically the items that have coupons aren’t healthy and we stick to a pretty healthy diet for ourselves and our children. We have cut out a lot of processed foods and shop a lot more of the perimeter of the store rather than the center aisles. I do price compare everything and will stock up on stuff I know we will use when it’s on sale and take advantage of Publix’s bogo deals they always offer. Our Publix allows you to just buy one item at the 1/2 off price AND if they have deals like “10 for $10” or something then they also allow you to buy less for the same price per item as if you bought all 10. I know this varies from store to store but I love it! 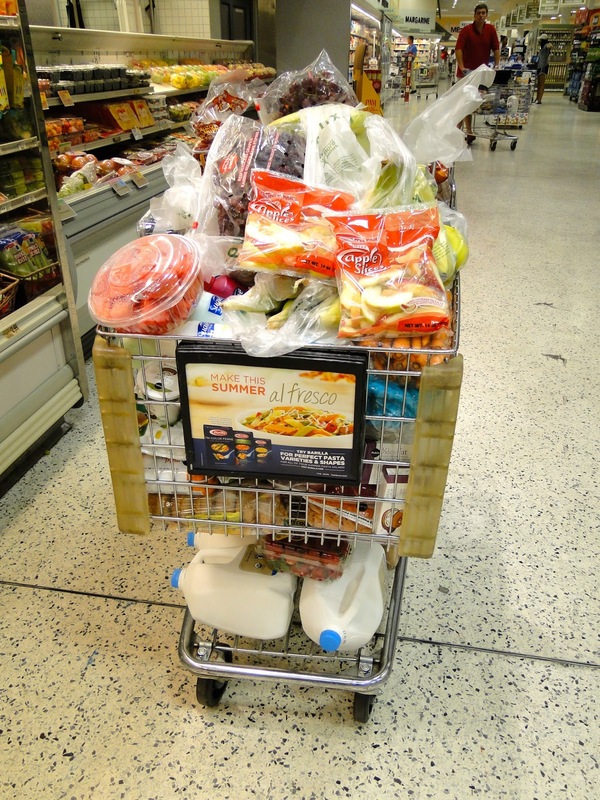 Typical shopping cart by the time I head to check out! Once we add another baby to our family I’m pretty sure I’ll require two shopping carts. I’m not sure how I’ll work it out then? I’ve thought about it and will probably do 1 cart then take it up to the front and have them hold it while I start the second one. I already take up two carts once they bag it all. I ALWAYS have to have someone help me out to the car 🙂 Many of the Publix workers know me and my life story by now haha. Once I get home Zach and Kye help unload everything and I add the items I purchased to the Prep and Pantry App before putting them away. My grocery shopping experience is quite the adventure but I love that I do it ONCE and then I’m done for a month! It makes it easier to budget and we save gas money too not having to run to the store all the time! I know the #1 thing people ask about my shopping once a month is how I make the food last that long. My two word answer: FREEZE IT! I freeze a TON of stuff. We have a stand alone deep freezer, a freezer in our kitchen attached to the fridge and another one attached to our garage fridge. All three are FULL at the start of the month. That’s another thing I wonder about when we have another baby…we will probably need to add another freezer too! I freeze all of our meat. I buy frozen vegetables. I buy fresh fruit but as it begins to age I also freeze that. I even freeze milk! I know that freezing things supposedly causes some of the nutrients to be lost but we all eat pretty healthy and I don’t stress over that. I cook at home, my kids get a variety of healthy foods, why stress over if it’s fresh or frozen? The meat goes straight into the freezer when I come home. We do like some fresh veges and eat them at the start of the month (fresh corn on the cobb is our fav!) and you’d be surprised how long fresh veggies stay good as well. Carrots do great in the fridge for a long time! And sweet potatoes and butternut squash also last a long time in the pantry! We buy all organic milk for our family. Zach and I actually don’t really drink milk anymore but our kids do at each meal. We have to buy two types as Britt is on whole milk and Kye is on skim. I will keep a couple gallons in the garage fridge when I know we will use them before they expire but the rest of the milk I buy for the month I stick in the deep freezer. I don’t open the gallons and just toss it in. When I need it I get it out and put it in the sink with some warm water and let it thaw out. It works GREAT! The milk will stay good as long as it would have if we’d used it right after I got home from the store. None of us can tell a difference between milk that is “fresh” and the milk that has been frozen. I also freeze yogurt and cottage cheese (again just leaving them in the containers and popping them in the freezer). While I haven’t eaten either of them myself after they thaw out…the kids love them! My kids eat a LOT of fruit. I have paid attention to how long fruit lasts each month and know an “order of importance” as far as what fruit needs to get eaten quick and what fruit can stay good longer. Anything I buy that’s pre cut at the store (watermelon) needs to be eaten first. Peaches, pears, plums, and other such fruit gets eaten next. Then apples, oranges, and kiwi stay fine for pretty much the whole month. We love grapes, strawberries and blueberries and eat them throughout the month. They usually last a week or two in the fridge before they start to go bad so I will wash them then freeze them all and the kids LOVE them frozen. At the end of the month when we run low on the fresh stuff, I bust out the frozen goodies to make it until the next shopping trip. I learned a tip awhile ago to never wash any foods until right before you eat them as it helps them last longer! Every morning each child eats 1/2 a banana for breakfast. Bananas do not stay fresh very long! I typically buy around 20 bananas (I try to buy the greenest ones I can find so they will last longer) at the start of the month. They eat fresh ones for about a week then when they start to turn brown I will peel them all, cut them in half, and freeze them. In the mornings I get out 1/2 a frozen banana for each child and it thaws while I fix the rest of their breakfasts. I cut it into chunks and they enjoy it! They both actually prefer the “cold bananas” over the fresh ones! They do get mushy though if not eaten right away so if we are traveling I won’t take them in car or anything like that. I also wouldn’t use them to make banana sandwiches for lunches…I only serve those at the beginning of the month. I also buy all the bread products we need at the start of the month. I leave out one loaf for us to eat and freeze the rest! I put an extra bread bag (just an old bag from loaves we have finished) over the loaf and put it in the freezer. I get out the slices we need from the freezer each time I need to use the bread. The frozen slices thaw super quickly. Often my kids eat toast so I just toast it a little longer than I normally would. If they are having a sandwich I will make it on the frozen slice. It actually makes it easier to spread the peanut butter on it! Zach likes to thaw his in the microwave for a few seconds. I’ve never eaten any of the frozen bread but the kids can’t tell a difference and Zach hasn’t complained so I guess it’s fine 🙂 We also freeze bagels (which I have eaten and can’t tell a difference), buns, etc. I feel like we have a really good system down at this point and don’t see it changing much anytime soon. We waste MUCH less food than we used to. Gah, I can remember countless times having to throw out stuff in the fridge and pantry b/c it went bad before we got to use it. That RARELY happens now. As we use items I am mindful to update the Prep and Pantry App and to keep up with the running grocery list so we know what we need. Zach packs most of his lunches while working and eats left overs typically at lunch time. I started having left over nights for dinners to cut down on our grocery costs and to make sure all the food actually gets eaten before it spoils! Any questions on how I do our once a month shopping??? I will come back to this post and update anything anyone has a question about. It’s all second nature to me so I may have left out something without realizing it 🙂 Hopefully this helps those of you who have been wanting to try the once a month shopping plan! If you have any helpful tips I’d love to hear them! Previous Post Britt is 18 Months Old! Great post. I am curious as to if you still use this approach? Would you share your menu plan? And, if comfortable, your monthly grocery budget. I have always struggled with grocery shopping and menu planning – it stresses me to the max and I am thinking that if I can reduce the stress to once a month, once-a-month shopping may be worth a shot. Thank you!